The film takes place in New York City in the 1920s. That’s before Harry Potter was born, but his future headmaster Albus Dumbledore was then at the magical school Hogwarts, where he taught a budding zoologist named Newt Scamander. The movie is about Scamander’s search for magical beasts, a search that takes him to the United States. It turns out there’s a thriving magical community in the States, complete with a U.S. school of magic. That school is called Ilvermorny, and it was founded by an Irish immigrant to America. The story begins in County Kerry. There, a young witch named Isolt Sayre is born in 1603. (Read the real history of Ireland in this period.) Isolt is part of a magical family, but her parents die, leaving her in the care of an eccentric and malevolent aunt. The aunt, a practitioner of dark magic, hates non-magical human beings and tries to make Isolt hate them as well. Coomloughra is a real place, located about 20 miles west of Killarney. 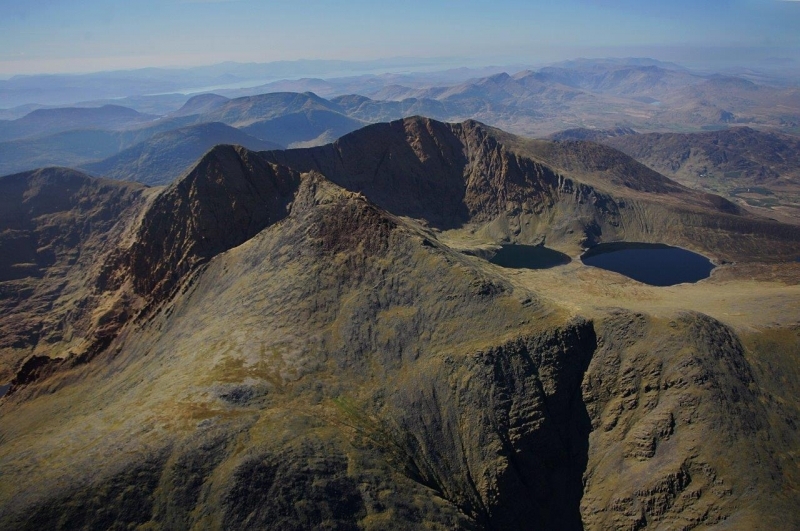 The area offers one of Ireland’s best ridge walks, a strenuous 4- to 5-hour hike over several mountain peaks in the MacGillycuddy’s Reeks range. The Coomloughra Horseshoe Loop Walk in Kerry. To get away from Gormlaith, Isolt runs away, first to England and then to America, disguising herself as a boy and traveling on the Mayflower. Hiding in the forests of North America, Isolt befriends magical creatures and has many adventures. She meets and marries a non-magical man, they start a family and eventually open their own school of magic: Ilvermorny. But the aunt eventually learns of Isolt’s whereabouts and comes to find her, seeking to punish the niece for both running away and marrying a man who is not a wizard. A great battle ensues, and Isolt’s family eventually wins the day. To train and teach magical children in more peaceable ways, they open the school of Ilvermorny. Ilvermorny, located in Massachusetts, grows and flourishes, accepting wizards and witches from around North America into one of its four houses: the Horned Serpent, the panther Wampus, the Thunderbird (one is seen in “Fantastic Beasts”) and the magical creature the Pukwudgie. The story of this Irish-American witch has a lot of classic elements of J.K. Rowling’s wizarding stories. The story encourages open-mindedness, bravery and adventure, and it calls for peace between magic and non-magic people. This entry was posted in Arts & Culture, History, Irish America and tagged Coomloughra, J.K. Rowling, kerry, Killarney on December 7, 2016 by admin.